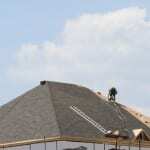 We at Slippery Slope Roofing know that no one wants to have to deal with a damaged roof. Many people are fortunate enough to avoid major roof damage, but even these lucky souls will eventually have to replace their roofs. Even if you never suffer catastrophic damage to your roof, it will still be subject to wear and tear that will gradually break down the roofing material. It can be difficult to know when your roof has worn down to the point of needing replacement, so our team at Slippery Slope Roofing has put together this list of signs to look for. Your shingles don’t lay flat. One sign that your roof may be reaching the end of its life is the shingles starting to warp. If the edges of your shingles are curling up or your shingles are starting to cup, it may be time for a roof replacement. If you leave your shingles to peel away further you could expose your home to water damage. Your shingles have cracks or bald patches. When you inspect your roof, check for any cracks or patches of missing granules. Both are signs that your shingles are weakening and that you may need a roof replacement soon. Moss is growing on your roof. In cool, moist climates, it’s common for moss to start growing on your roof. In addition to looking bad, moss on your roof can damage it over time–the moss holds moisture close to the shingles, and when the moisture freezes it can damage them. While our team at Slippery Slope Roofing may be able to help you get rid of moss and stop the damage before it becomes severe, it’s also possible that you’ll need a roof replacement.